ALBUM REVIEW: ‘ruiner’ by nothing,nowhere. For all the notions of Lil Peep being “the future of emo”, the conversation of what really deserves that label doesn’t seem to have been seriously considered until after his death. As the de facto face of SoundCloud rap, his music represented a brave new world for those unfamiliar with the genre, particularly in the case of rock journalists who would ultimately strip-mine what was there to boon up their ever-waning credibility. But emo-rap seems to have become a legitimately viable genre, albeit one chastised by the faces it’s been attributed with on the most mainstream level, like the overwrought whining of XXXTENTACION or the insufferably dumb bravado of 6ix9ine. On the rock side, however, all the chips have been put on nothing,nowhere., the pseudonym of Joe Mulherin who, after touring with acts ranging from La Dispute and Real Friends to Good Charlotte and receiving acclaim for his album Reaper from a decidedly rock-leaning audience, has become the next artist to have the “future of emo” tag thrust upon him. 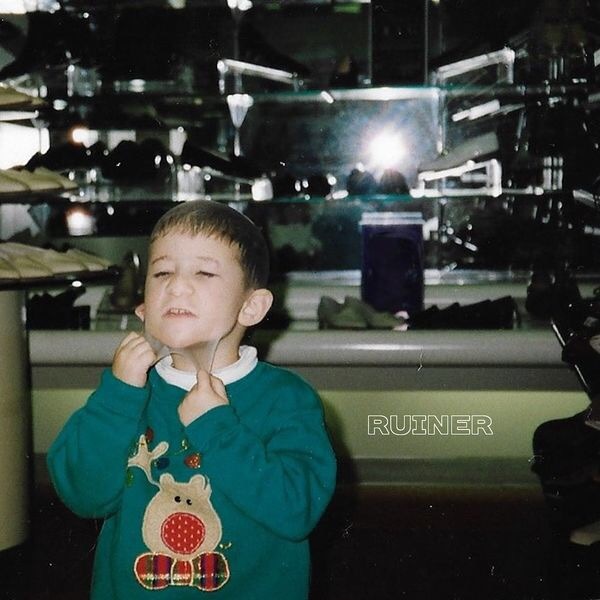 And going off new album ruiner, it’s easy to see why nothing,nowhere.’s music is getting the promotion that is is, primarily because it ticks every single box of “alternative crossover cash cow” with consummate ease. Say what you like about XXXTENTACION and 6ix9ine, but at least there’s the potential for energy or wild, inconsequential veering; nothing,nowhere., in the other hand, feels about as pruned-back and marketable as this sort of thing gets, and even with a more cogent sense of emotion, it’s still too simplified to make for a truly compelling listen. Basically, it’s exactly what you’d expect from the people whose idea of the most innovative and boundary-pushing out there is Twenty One Pilots. That said, there’s at least some appeal that becomes apparent in Mulherin’s more literal take on emo-rap – any trap skitters are greatly subdued and replaced a more standardised hip-hop beat, while gentle, sepia-kissed guitars swirl and simmer away in the background. It gives tracks like hammer and sayer a great sense of atmosphere and breathy melancholy, especially in the case of the latter with Mulherin retracting into a lower, more vulnerable vocal delivery. In general, the vibe of washed-out reservation has a lot of mileage in it; even when the beat hits a bit too heavily to really work on vacanter, it’s still a lot more natural and appealing than the dour, drowned void that tends to swallow up much of emo-rap. The same could be said about Mulherin himself, at least on the face of it. Any mumbling or hazy slurring is dispensed in favour of a much clearer, direct flow, and even though his singing still leaves a lot to be desired, the willowy sheen on a track like reminiscer captures the insularity and darkness in a far more legible fashion. That’s pretty much it though, and ruiner’s crucial faults all boil down to how little Mulherin has to offer beyond this. For one, he’s not all that dexterous of a rapper, with his incredibly basic flow and totally unconvincing attempts at sound aggressive and angsty on better perhaps being the worst case. It might sound like a flimsy argument, but when the crux of the album is supposed to be an intense purging of gnawing depression, it can’t help but feel as though Mulherin has started to cave to his own promise or marketability. Even in the language itself, there’s not that much here, and though Mulherin can sell dejection with ease, the lack of real personal details beyond blanket statements with the occasional glimmer of individuality. Amidst all of this is hammer, a baffling flexing track that feels totally at odds with the rest of the album thematically (save for perhaps one line), and in Mulherin opting for his most delicate, meek delivery, it’s a track with no clue what it wants to be, or why it’s even here. The fact that it’s this album’s most memorable moment purely for its lack of purpose or cohesion feels particularly disappointing, but that’s not exactly wrong. There’s no denying the emotional impetus that has gone into ruiner, but Mulherin’s execution feels so watered-down, stripping away what should be a far more incisive listen. What’s left is a solid shell of an album with all the meat to fill it out completely sucked away, rarely able to match the darkness that Mulherin wants to convey. Only when he finds a way to fit all the necessities in will the future of emo become a reality rather than some lightly-sketched conjecture. ‘ruiner’ by nothing,nowhere. is out now on Fueled By Ramen. Posted on April 16, 2018 0 By thesoundboardreviews	Albums Posted in Albums, Reviews Tagged #Album review, emo, hip-hop, Luke Nuttall, nothing nowhere.